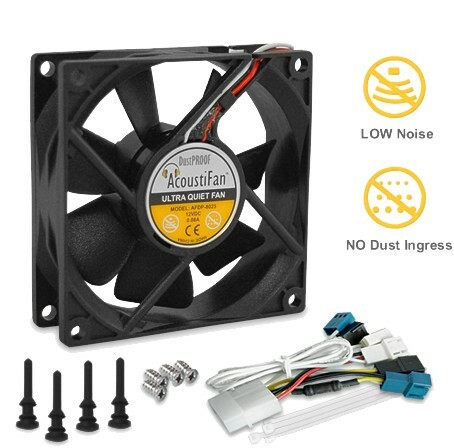 Acousti's DustPROOF fans feature a sealed motor that prevents dust ingress, keeping the fan quieter for longer. Bought this and its 92mm twin as a final stage in an overhaul of a Dell XPS 8100. This 80mm replaces the fan that came on the dell heat sink, this is incredibly quiet and cools the CPU by a considerable degree compared with the factory installed one. Silent and very easy to fit (motherboard and molex connections included). rubber mounts also included. All good. Completely agree with the other reviewer. As I said in my review of the 120mm version of these, they are brilliant and very quiet. Well worth the extra cash! Easy to fit, the rubber mountings are great. Absolutely silent, incredible!